LAS CRUCES, N.M. – The New Mexico State men’s basketball team escaped an upset bid by last place Bakersfield, 89-86, on Thursday night inside the Pan American Center. The Aggies improve to 16-7 overall and 5-2 in Western Athletic Conference play while the Roadrunners fall to 8-13 overall and 1-6 in the WAC. Vote to Help NMSU Get Money for Scholarships and Kevin Aronis into 3pt Contest! NM State narrowly thwarted what would have been a devastating blow to its WAC championships hopes. A loss by the Aggies would have meant that they would be three games behind WAC-leading Utah Valley who remained undefeated in WAC play by easily handling Texas-Pan American on Thursday night. The Aggies seemed to have the game under control, leading by double digits or close to it for most of the game. But a 13-0 Bakersfield run in the latter portion of the game gave the Roadrunners their biggest lead of the matchup, 80-74, with five minutes remaining in the contest. NM State allowed 50 second-half points to Bakersfield. But the Aggies finished the final five minutes of the game by outscoring Bakersfield 15-6. NM State used good defense, including three blocks, a big three by junior guard K.C. Ross-Miller and 6-of-8 free throw shooting in the final two minutes to take a three-point lead with 5.5 seconds left. Still, NM State could not breathe easily until a desperation three by Bakersfield guard Zach Lamb clanked off the backboard at the buzzer. The Aggies were heavily aided in the win by sinking 32-of-44 free throws in the game for a 72.7 free-throw percentage. Although the Roadrunners shot 80 percent from the free-throw line, they only attempted 25 free throws, 19 less than the Aggies. NM State also shot 53.1 percent from the field (26-of-49) and 38.5 from 3-point range (5-of-13), but 14 Aggie turnovers almost cost them the game as Bakersfield converted those 14 turnovers into 24 points. Junior guard Daniel Mullings led the Aggies with 19 points, including four points in the final two minutes. Center Tshilidzi Nephawe added 15 points and a game-high nine rebounds, missing his seventh double-double of the season by one rebound. Sophomore center Sim Bhullar made his first appearance in WAC play after missing six games with a foot injury and his presence was important. He finished with 13 points and six blocks on the night, as the Roadrunners noticed his attendance in the paint. Junior guard DK Eldridge also finished with 13 points while senior forward Renaldo Dixon added another 12 points. NM State and the Roadrunners traded jabs early in the game as each team felt the other out. It would be the Aggies, however, that would make the first significant move, and it would be as Bhullar made his first appearance in a conference game this season. Bhullar came into the game after the under-16 media timeout. Trailing 11-8, the Aggies embarked on a 9-0 run over the next four minutes to take a 17-11 lead with just under 12 minutes left in the first half. The run started with Bhullar’s first block in WAC play this season and finished with the NM State big man scoring his first bucket in conference play. In all, the Aggies outscored Bakersfield 10-2 during Bhullar’s first action in over a month. The Roadrunners would pull within one at 17-16, but another Aggie run, this time a 13-3 run, put the NM State lead at double digits for the first time in the game. The Aggies led 30-19 with just under seven minutes left in the half. NM State would lead by as many as 13 with under five minutes left in the first, but Bakersfield did not go away quietly. A 14-3 run brought the Roadrunners right back into the game. With just over two minutes left in the first half, the Aggie lead was down to two points, 38-36. The Aggies answered, however, scoring the last nine points of the half, and after a Mullings’ shot at the halftime buzzer NM State’s lead was back in double digits at 47-36 heading into the locker room. NM State shot well in the first half, sinking 17 of 27 shots for a 63.0 shooting percentage while holding Bakersfield to 37.5 percent (12-of-32). The Roadrunners, however, outshot the Aggies from 3-point range, 60 percent (3-of-5) to 42.9 percent (3-of-7), and from the free-throw line, 81.8 percent (9-of-11) to 66.7 percent (10-of-15). Dixon led NM State at the half both in scoring (12 points) and rebounding (six rebounds). Nephawe added nine points and five rebounds while Bhullar was a perfect 2-for-2 from the field and 2-for-2 from the charity stripe to finish his first half of action in over a month with six points, three boards and three blocked shots. Eldridge scored five-straight points early in the second half to once again open up the Aggie lead to 13 points. But a rare four-point play from Bakersfield guard Javonte Maynor after he was fouled on made 3-point shot brought the lead right back to single digits at 54-45 with just under 17 minutes to play in the game. In fact, the four-point play started a 12-2 Roadrunner run that cut the NM State lead to 56-53 with just over 14 minutes left. Once again, however, it would be Eldridge that would increase the lead back to nine, this time with an old fashion 3-point play. A couple of minutes later senior guard Kevin Aronis hit a three on a fast break to keep the lead at nine, 67-58, with 10:47 left in the matchup. The back-and-forth continued as Bakersfield refused to fold. A 3-pointer by Roadrunner senior forward Corey Hall gave Bakersfield its first lead since early in the first half. The 3-pointer was part of the 13-0 run that gave the Roadrunners their biggest lead at 80-74 with just over five minutes left to play. The Aggies were held scoreless for just under three minutes. NM State’s schedule does not get any easier as the Aggies now welcome those conference-leading Utah Valley Wolverines to the Pan American Center on Saturday, Feb. 1. The matchup of the top two teams in the WAC will go a long way in deciding the WAC champion. Saturday’s game is scheduled for a 7 p.m. (MT) start and will be a white-out game. The 2014 NM State Hall of Fame inductees will also be honored at halftime. 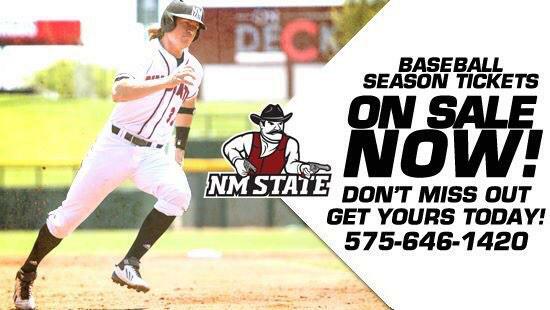 Fans are encouraged to come out in full force to support the Aggies in this crucial WAC matchup. NMSU recognized more than 300 student athletes tonight with GPAa of 3,0 or better. Impressive.